John George was baptised in the Beeston Parish on 20th April 1898. He attended the Church Street School as a boy, at this time joining the newly formed Boys Brigade in Beeston. He enjoyed his outings in the evenings to the Beeston Lads Club, where he took an active part in the proceedings there, especially the Educational Classes. Having left school at the age of thirteen he followed in his fathers occupation at the Trowell Moor Colliery, until he was called up. 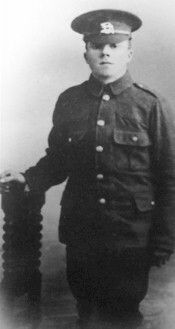 Having attested when he reached his eighteenth birthday, he enlisted in the 1st Battalion Leicestershire Regiment, where he was later drafted to France. He was badly wounded in action on 16th September 1918, and died of his wounds three days later. He was buried in the Guillemont Road Cemetery. At the time of his death his parents had moved to 44, Villa Street in Beeston. The War Diary notes the advance of a tank about 5.30am, which fired into German trenches; the response from enemy machine guns seemed to have no effect. The battalion attacked at 6.20am - "B" and "D" Companies advanced followed by "C" and "A" Companies. They were met by immediate machine gun fire from the enemy line. The attacking force were held up by strong wire netting in front of German trench leading to North-West corner of The Quadrilateral. It was during this attack that Private Stafford was wounded. On the 17th the battalion withdrew to Maltz Horn Farm. Guillemont Road Cemetery - Guillemont is a village, 12 kilometres east of Albert. It was an important point in the German defences in July 1916. It was taken by the 2nd Royal Scots Fusiliers on the 30th July but the battalion was obliged to fall back; and it was again entered for a short time by the 55th (West Lancashire) Division on the 8th August. On the 18th August it was reached by the 2nd Division, and on the 3rd September (in the Battle of Guillemont) the village was captured and cleared by the 20th (Light) and part of 16th (Irish) Divisions. The village was lost again in March 1918 during the German Spring Offensive but retaken on the 29th August by the 18th & 38th (Welsh) Divisions. 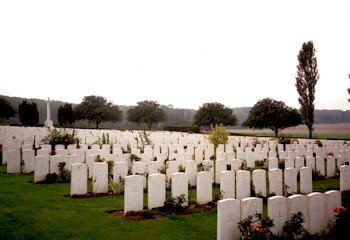 The Cemetery was begun by fighting units (mainly Guards Division) and Field Ambulances and was closed in March 1917. It was greatly increased after the Armistice by the concentration of graves (almost all of July-September 1916 from the battlefields immediately surrounding the village.